Kitchen faucets and laundry faucets serve two very different functions and are not interchangeable, except if one wants to wash dishes, but even then, it's best to use the kitchen sink. Kitchen faucets have an 8-inch center, whereas laundry faucets typically have a 4-inch center. A faucet's center refers to the distance from the hot water inlet to the cold water inlet. The aerator on a laundry faucet will have a 3/4-inch threading on it, so you can attach a garden hose directly to the neck of the faucet. Kitchen faucets will not have an aerator like this; theirs will be more decorative and are easily broken. Kitchen faucets, besides function, are concerned more with style and color than laundry faucets. Laundry tub faucets are built for utility and most are made out of stainless steel or brass for a longer lifetime. Kitchen faucets are meant to be an accent in your kitchen, enhancing its overall aesthetics. The supply lines for kitchen faucets are also in a different location than those on laundry faucets. 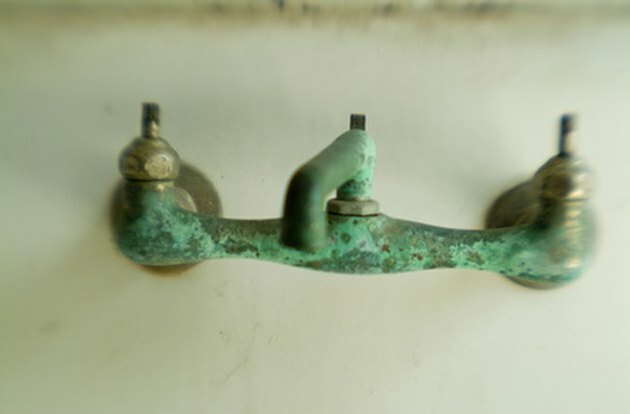 Kitchen faucets' supply lines are on the bottom and drop through the holes in your sink, whereas most laundry faucets have copper water pipes soldered into the top of them. Many new kitchen faucets also let you change the flow of water, whereas laundry faucets don't offer this option. Kitchen faucets can also reach a larger surface area than laundry faucets.